Ian Campbell, the Program Manager for the WWF Global Shark Program, recently tweeted that Projects Abroad have “possibly the most important shark project in the world”. 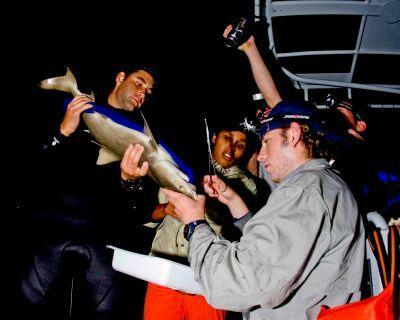 Since the Shark Conservation project started in January, 200 volunteers have signed up to assist the local scientists in Fiji. This huge success is due to the hard work of the conservation team in Fiji, headed by Ingrid Sprake. With their passion and dedication, they have raised awareness and developed educational workshops to truly inspire everyone who takes part. ‘After a while you become more and more educated about the reality of these supposedly notorious predators, and realize that they are in fact not to be feared by us, but to be respected and protected,’ explained Conservation volunteer, Ellen Mackenzie. A study conducted by the International Union for the Conservation of Nature (IUCN) concluded that a quarter of all ray and shark species are endangered. Overfishing is possibly the main culprit with a recent independent report estimating that up to 73 million sharks are killed for their fins each year. However, in spite of these distressing figures, the Shark Conservation project in Fiji is a unique shark-focused program that gives hope and enables volunteers to contribute to the understanding of these animals.